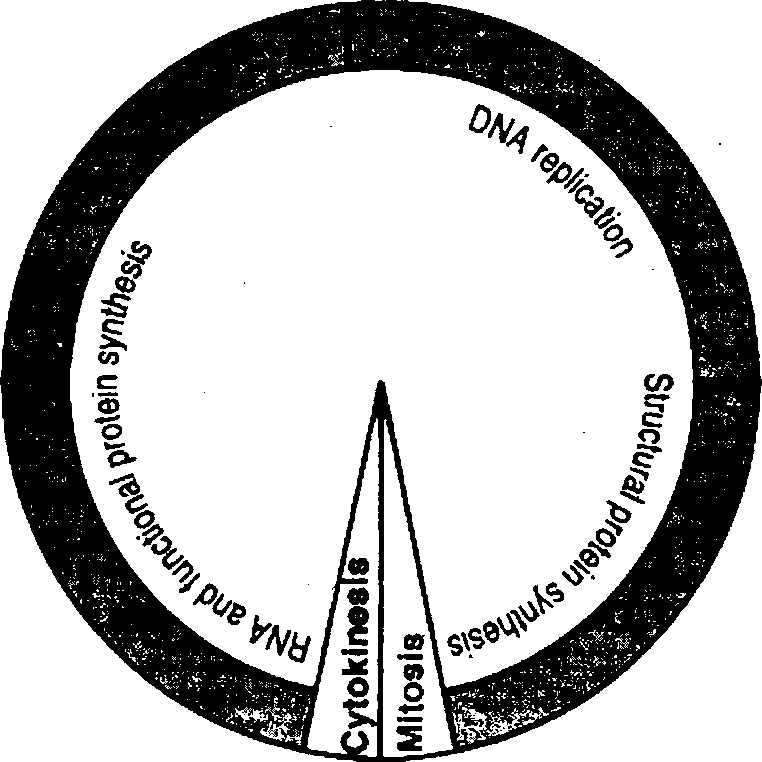 There are two models of evolution based on the rate of evolution. 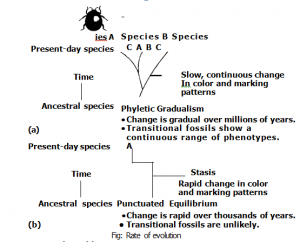 The concept that evolutionary changes occurs gradually over millions of years is called phyletic gradualism. Charles Darwin believes in this concept. It is the traditional interpretation of the rate of evolution. However, some evolutionary changes occur very rapidly. Long periods of stasis interrupted by brief periods of change are called the punctuated equilibrium model of evolution. It shows that evolution does nol take place gradually. Biologists have observed such rapid evolutionary changes in small populations. (a) Stasis or equilibrium: The periods in which many species do not change significantly over millions of years are called stasis or equilibrium. Stabilizing selection takes place during the periods of stasis. .
(b) Punctuates: The geologically brief period of change is called punctuates. The directional or disruptive selection occurs during the periods of change. States are interrupted by ecological crisis. These ecological crises are change in climate or a major geological event. Some variations are selectively neutral or disadvantageous. But these variations may be advantageous over the next 10,000 to 100,000 years. New habitats are becoming available due to geological events. Events that occur in 10,000 to 100,000 years are almost instantaneous in an evolutionary time frame. This geologically brief period of change is called punctuates. Then next period of stasis start. Insect pests and bacteria acquire rapid pesticide and antibiotic resistance. Peter K. Grant studied finches for 20 years. He has shown that natural selection caused rapid morphological changes in the bills of Galapagos finches. There was long dry period from the middle of 1976 to early January 1978. The birds developed larger deeper bills during this period. The birds quickly consumed smaller easily cracked seeds early in this dry period. They were forced to turn to larger seeds. Therefore, the birds with weaker bills were selected. Thus measurable change occur in the finch population of the island Daphne Major. The punctuated equilibrium model has one advantage. 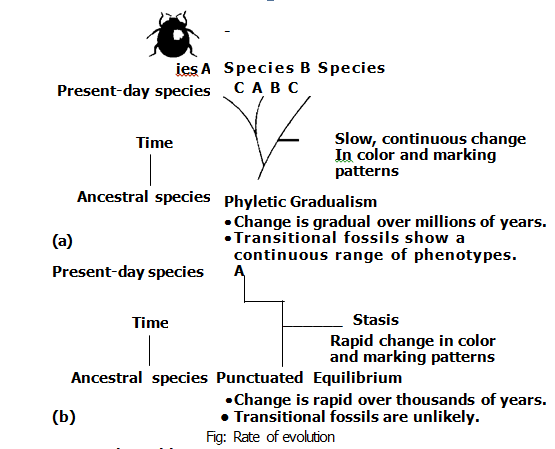 The fossil record of punctuated equilibrium does not always show transitional stages between related organisms. Gradualists do not accept an event without transitional forms to fossilization. But many transitional forms disappeared without leaving a fossil record. Punctuated equilibrium involves rapid changes in small, isolated populations. Thus preservation of intermediate forms in the fossil record cannot take place. The rapid pace of evolution causes jumps from one form to another.